Two stories caught my attention recently because they involve taste and mice, subject matters not often found together. The first is a study that suggests that in addition to salt, sweet, sour, bitter and umami we may have a sixth taste—a taste for water. 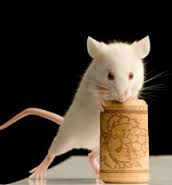 A team of scientists from the California Institute of Technology led by Yuki Oka were able to isolate taste receptor cells in mice that respond to water. The most surprising part of the project” was that the well-known, acid-sensing, sour TRCs fired vigorously when exposed to water, Oka says…More research is needed to precisely determine how the acid-sensing taste buds respond to water, and what the mice experience when they do, Oka says. But he suspects that when water washes out saliva—a salty, acidic mucus—it changes the pH within the cells, making them more likely to fire. The long-held assumption that we have only 5 basic tastes is increasingly on shaky ground. The resulting wines span the entire gamut from sensational and pure to dirty and borderline undrinkable. The mucky aftertaste generally known as ‘mousiness’ is a much more slippery pest. Poorly understood in the industry, virtually opaque to consumers, it has neither been conclusively researched nor openly acknowledged by some producers. Yet this unmistakeable taint – once recognised, never forgotten – seems to be on the increase, scurrying ever more rampantly around the cellars of a thousand radical vignerons….The taint manifests itself in a unique and troublesome fashion – the compounds are not volatile at the normal pH level of wines, and thus are virtually undetectable by smell. When infected wine mixes with the taster’s saliva, the pH is raised to a level where the 2-acetylpyridine is perceived retronasally – an aftertaste which is technically an aroma. This nasty surprise can sometimes take as long as 30 seconds to develop in the mouth, giving an entirely new meaning to wines with a ‘long finish’. That all sounds unpleasant. But I taste a lot of wines every year, sometimes as many as 100 in a week, and I don’t recall any that reminded me of mouse cage. But maybe that’s just me. Anecdotal evidence suggests there’s a very wide range of tolerance amongst wine professionals and consumers, from blissful ignorance to super sensitivity. An individual’s ability to detect mousy taint may well hinge on the pH level of their saliva – ergo possibly a genetic condition. Most but not all of the wines I taste have been vinified using some SO2 so maybe I’m not sufficiently exposed to “mousy” wines. At any rate, we have a new wine flaw to be concerned with and I’ll be scrutinizing tasting menus for any hint of “mouse cage”. I’ve long suspected, based on intuition (which is often worth exactly nothing), that the standard taste model is wrong. 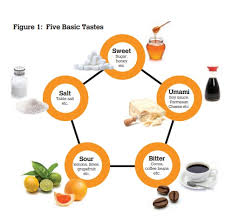 The standard taste model claims that there are only 5 basic tastes: salt, sour, sweet, bitter and umami. Umami was just admitted into the pantheon by Western science a few years ago. Everything else we experience as taste is a function of smell according this model. The difference between a tomato and cheese aside from basic tastes is a matter of smell (putting aside texture of course). That has always struck me as implausible. Recently, scientists have tentatively put forward the idea that fat may be a basic taste. And now an Oregon State professor has done research that suggests we can taste carbohydrates as well. To test the sixth-taste theory, Dr Lim and her team dissolved different levels of carbohydrates in liquid solutions and gave them to 22 participants who were asked to rate how each tasted. “They called the taste ‘starchy’,” Dr Lim said. Previously, many scientists believed that humans could only taste the sugar in carbohydrates, as enzymes in our saliva break starch molecules into simple sugars, leaving a sweet taste in our mouths. But even when volunteers were given a compound to block the saliva enzyme and sweet receptors, they were still able to taste the starch – which suggests humans can pick up on a starchy flavour before it has been broken down into sugar. Thus far there is no evidence of taste receptors for starch on the tongue so this is not a done deal. But it joins a long list of other sensations–of carbonation, a metallic flavor, and amino acids as well as kokumi, a flavor some describe as hearty—that scientists are investigating as basic tastes. It would seem the standard model of taste is increasingly under threat. I suspect most people would say “good taste” is an ability to discern what other people in your social group (or the social group you aspire to) find attractive. Since most people cannot say much about why they like something, it seems as though good taste is just the ability to identify a shared preference, nothing more. But looked at from the perspective of artists, musicians, designers, architects, chefs and winemakers, etc. this answer is inadequate. It doesn’t explain why creative people, even when they achieve some success, strive to do better. If people find pleasure in what you do and good taste is nothing more than an ability to identify what other people in your social group enjoy, then there is little point in artists trying to get better, since the idea of “better” doesn’t refer to any standard aside from “what people like”. So it seems like there must be more to good taste than that. But philosophers have also struggled to say more about what good taste is. David Hume, the 18th Century British philosopher, argued that good taste involves “delicacy of sentiment” by which he meant the ability to detect what makes something pleasing or not. In his famous example of the two wine critics, one argued that a wine is good but for a taste of leather he detected; the other argued that the wine is good but for a slight taste of metal. Both were proven right when the container was emptied and a key with a leather thong attached was found at the bottom. Thus, Hume seemed to think that good taste was roughly what excellent blind tasters have—the ability, acquired through practice and comparison, to taste subtle components of a wine that most non-experts would miss and pass summary judgment on them. The same could be said of the ability to detect subtle, good-making features of a painting or piece of music. The virtue of such analytic tasting of wines is that the detection of discreet components can at least in theory be verified by science and thus aspires to a degree of objectivity. Flavor notes such as “apricot” or “vanilla” are explained by detectable chemical compounds in the wine. There is something right about Hume’s model of taste. Someone practiced at discerning elements that ordinary tasters would miss is an indicator that someone has good taste. But I don’t think this model is quite right. Good taste involves evaluating quality, and the quality of a wine, painting or piece of music is seldom a function of the components of the work taken individually. A wine taster can identify a whole bowl of various fruits wafting from a wine, pronounce the acidity to be bracing and the tannins fine-grained but firm, and still have said little about wine quality. Wine quality is a function of structure, balance, complexity, and intensity supplemented by even less concrete features such as deliciousness, power, elegance, gracefulness, or refreshment. None of these features can be detected by analytically breaking down a wine because they are inherently relational. No single component can account for them; it is a matter of how the components are related. Even a prominent feature like acidity is not merely a function of Ph; perceived acidity differs substantially from objective measures of acidity and is influenced by the prominence of other components such as sugar and tannin levels. None of these relational properties seem amenable to scientific analysis. I doubt that gas chromatography can identify elegance; a wine’s balance cannot be appreciated by measuring PH and sugar levels. Identifying these aesthetic features involves a holistic judgment, not an analytic one. The wine as a whole must be evaluated. (The same holds true of evaluating a painting or piece of music) But although these holistic features, in a wine, are a product of fruit, acidity, tannic structure, etc., no list of wine components will add up to a wine being balanced, elegant or delicious. Another British philosopher, from the 20th Century, Frank Sibley, argued that this is a general feature of aesthetic judgments. There are no rules that get us from facts about the object, regardless of how subtle, to these holistic aesthetic judgments. Hence, the problem of good taste. What do you discern when you identify elegance, grace, or deliciousness in a wine? It’s not like picking out oak flavors. It’s a judgment about how everything comes together—a set of relations that emerge from facts about the wine but are not identical to any particular collection of facts. If it is not an analytic ability, what sort of ability is it? Wine: Will Chemistry Destroy the Romance? What do we seek to know when we gain wine knowledge? We learn to distinguish the taste of Cabernet from Zinfandel, recognize the different flavor profiles of French and American oak, uncover details about how the fermentation process is controlled, and identify the contribution of various winemakers, geographies, and weather patterns. 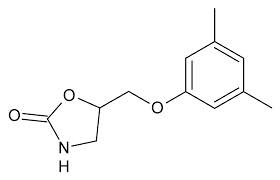 Of course, what all these factors we study do is modify the chemical structure of the wine. So the underlying assumption behind the pursuit of wine knowledge is that the flavors, aromas, and textures of wine are all explained by its chemical composition, that there is something in the wine that causes our tasting experience. The obvious implication is that eventually science will fully explain why we taste what we taste. In that perhaps not too distant future, will tasting notes be lists of chemical compounds instead of elaborate metaphors? Will we be able to call the lab to order a 2000 Lafite which was made on-demand from a template constructed from a chemical analysis of the original wine in the bottle? Is something lost from our experience of wine if it is reduced to chromatographic analysis? Is winemaking less artful if there is less intuition and risk involved? When a list of ingredients can tell you exactly how a wine will taste, the element of surprise and risk is removed from the tasting experience; and that is a significant loss. Of course, the one thing this scientific-reductionist account of wine does not take into account is the variety of subjective responses from tasters. (That too might be subject to full scientific description but that is perhaps further into the future) But will the imaginative, lyrical moods that wine encourages, which make our subjective experiences so enjoyable, be diminished in this world of hegemonic chemical analysis? The power of science to explain everything from the behavior of black holes to quantum states is perhaps the single greatest accomplishment of the modern mind. But the intensity of our subjective sensations even when they are illusions may be even more fundamental to a human life. I’m not persuaded that the scientific/reductionist account of wine is correct. But I will have to chew on this awhile before I know what I want to say about it. In the meantime, I will continue to enjoy those imaginative/lyrical moods. Food scientists have long insisted that there are only four basic tastes—sweet, salt, sour, and bitter—which correspond to what was thought to be four types of taste buds we have in our mouths. According to this paradigm, flavor differences between various foods can be explained by the relative balance between these four tastes plus differences in smell. Since human beings can detect thousands of smells, recognizing flavor distinctions was largely a matter of differentiating aromas. This 4-taste paradigm has provided fodder for the argument that food should not be taken seriously as a source of genuine aesthetic experience, since taste sensations are too simple and limited to be the object of serious contemplation. I have never been convinced by this 4-taste paradigm. Is the difference between the taste of chicken and beef, or potatoes and broccoli really just a difference in quantities of sweetness, saltiness, sourness, and bitterness plus aroma? Intuitively this strikes me as implausible. 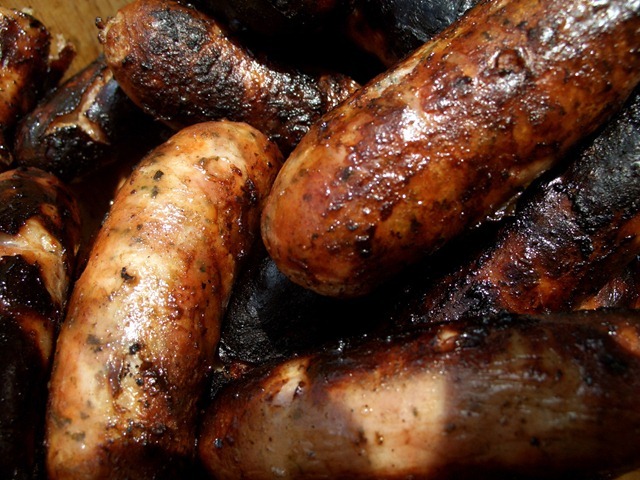 My craving for grilled sausages is not a craving for salt or sugar, yet it is nothing like an appreciation of the aroma of a rose either. There is something distinctive about a craving for fat. Our intuitions about nature are often wrong (the sun does not revolve around the earth), so we shouldn’t rely on them much. But I have always been skeptical that the 4-taste model is the last word on the subject. Science is beginning to confirm that skeptical intuition. The receptor for a fifth taste—umami (which roughly translated means “meatiness”)—was discovered in 2000, and the scientific community has gradually come to accept it as a fifth taste. More recently, some food scientists are arguing that “fatty” is not merely mouthfeel but is also a distinct taste, an hypothesis that received additional support from a new study published this week that identifies the receptor for “fattiness”. So now we know why “fat-free” usually means flavor free. All the more reason to ignore the lo-cal ice cream and reach for the real stuff. I suspect that eventually we will find still more taste receptors, and we are only just beginning to understand the complexities of the way the brain processes sensory information from the taste buds. Some scientists are convinced that complex differential patterns of activity across various cell-types explain perceptions of taste, rather then direct stimulation of particular types of taste cells. 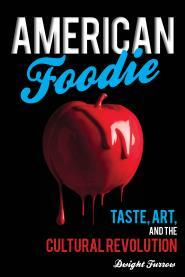 As the taste paradigm expands it will be increasingly clear that taste is far more complex than originally thought. When combined with our ability to discriminate aroma, the basic elements the chef has available for creative self-expression are every bit as complex as the painter’s palette or the musicians soundscape.